The Training Mask is great tool to add to you training, especially when a coach like Brain Mackenzie walks you through how to use it properly. 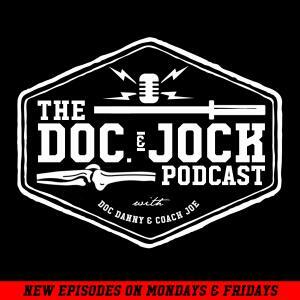 In this episode of the DOC and JOCK Podcast, Dr. Danny recaps his weekend with Coach Brian Mackenzie. Are You Optimizing Your Breathing To Improve Performance? In Episode 51 the Doc (Danny Matta) and Jock (Joe Szymanek) talk about Danny’s recent experience at Brian MacKenzie’s (the founder of CrossFit Endurance) Performance Breathing Camp. The fellas cover the in’s and out’s of Brian’s thoughts on using The Training Mask, incorporating Wim Hof breathing for better performance and of course getting naked in the snow. Joe & Danny catch each other up on the last week. They talk about running around naked in the snow and intro on how the Wim Hof method of breathing helps deal with extreme cold exposure and talk some epic life hacks including an inversion table and the Squatty Potty. Joe interviews Danny on his experience at Brian MacKenzie’s “Performance Breathing Camp.” Danny talks about the idea of using the Training Mask into the athletic workspace. He covers the finer points of how and how not to use the mask. Danny spends some time talking about what his wife, Ashley, took away from Brian MacKenzie’s seminar. He also talks about how the training mask can help help strength the anterior stabilizers after pregnancy. Danny throws some shade to dudes doing bicep curls wearing training mask, then gets into some deep knowledge on how using a Training Mask can help prime the entire breathing system for better performance in your workout. This might be the most important moment of this weeks podcast. If you don’t listen to anything else skip to this and listen to Danny and Joe talk about HOW you can be a serious competitor at the Sport of Fitness or any other sport. The cliff note is anyone can do volume, but volume isn’t enough to compete at a high level. Joe & Danny recap everything they covered in the podcast.